While commonplace today, satellite weather tracking was not possible before 1960. The first images of weather from space were taken by the TIROS I satellite on April 1, 1960. Today, different types of satellites, using a variety of tools, monitor and capture images of weather on Earth and in space. If you turn on your television during a major weather event, almost every channel will feature something similar: anchors and meteorologists donning waterproof attire, explaining the path of the storm with the help of a complex, brightly colored, satellite map. We take it for granted now, but before 1960 this type of weather observation was not possible. That all changed with the launch of the TIROS I on April 1, 1960. The satellite made it possible to observe Earth’s weather from outer space. Operating for three months, TIROS I transmitted thousands of images of cloud patterns and other phenomena to ground stations. 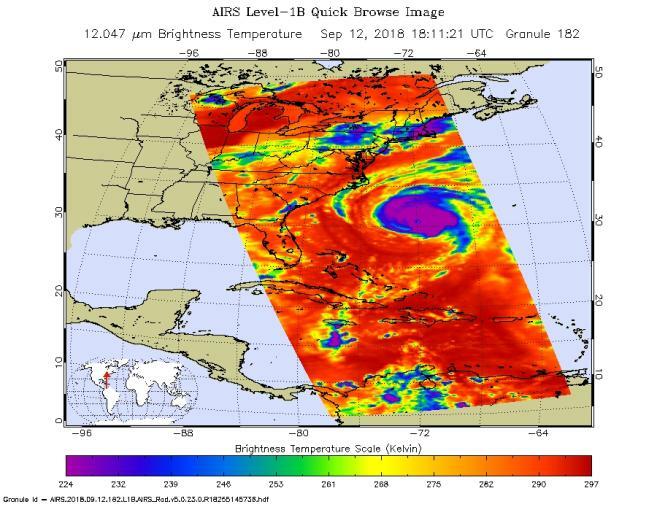 Today, a variety of satellites provide weather data to scientists. In addition to satellites like TIROS, geostationary satellites provide comprehensive coverage; these satellites orbit at the same speed that the Earth rotates, so it is as if they are over one spot all the time, Strain said. A variety of other NOAA and NASA satellites (and even the cameras aboard the International Space Station) capture and measure weather from space. Most recently, these instruments have been used to track Hurricane Florence as it approaches land. You can learn more about aerial and space observation in our Looking at Earth exhibition at our Museum in Washington, DC.